Due to this error, the CD/DVD drive did not appear in My Computer Windows. This error is little similar to the Code 39 error with CD/DVD drives. NOTE: Given steps contain removing of registry keys so professional skill is recommended for this solution. A small mistake during editing registry keys may affect your entire computer or laptop. 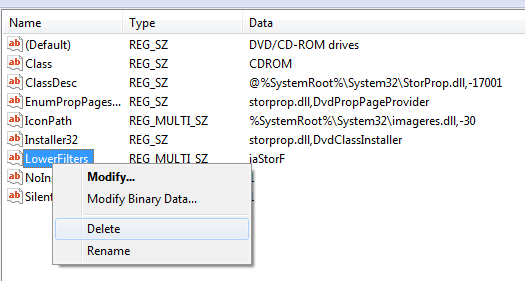 Step 3: This registry contains the class drive description of DVD/CD-ROM. Find any of the following names available in the right hand column. Step 4: If any of the above given keys are in the list, then delete them by right-clicking on them and selecting Delete option. Step 5: After applying Step 4, close the Registry Editor Window. Step 7: To verify that CD or DVD drives have come back or not, Open My Computer. 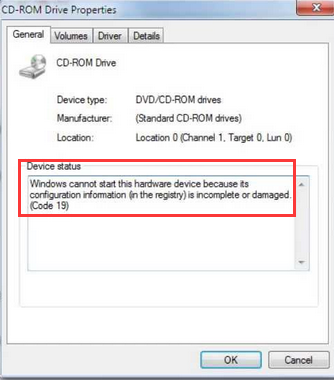 Also, open Device Manager and make sure that the yellow exclamation and error code on the CD or DVD drive is gone or not. If you are still unable to fix this issue or Code 19 error still appears; then remove the drive from Device Manager, restart, and allow it to reinstall the drivers. After it, update your drivers from the manufacturer’s website or Windows Update Center. After removing the UpperFilters and LowerFilters keys and updating the drivers, if you are still unable to fix this issue then it may be a hardware issue that will only be fixed by replacing the CD/DVD drive. Also Read: Top 5 Ways to Boot Windows 10 into Safe Mode! How to Fix This Issue Automatically? You can solve this error without applying the above given registry editing steps, with the help of a professional PC Error Repair Tool one can easily deal with this error. You don’t need to do anything manually, simply download and install this repairing tool and it will automatically fix the issue. This app is able to do lots of other things which will improve the PC performance, it able to solve all types of registry errors, DLL errors, EXE errors, Application errors, System Driver issue and more. This app easily repairs problems of any computer that affect the PC performance. Antivirus or antimalware program is one of the important security applications that protect our computer from all types of infection. But it is necessary to update this application on the regular basis because outdated antimalware or antivirus tool is unable to protect your computer or laptop from malicious infections. 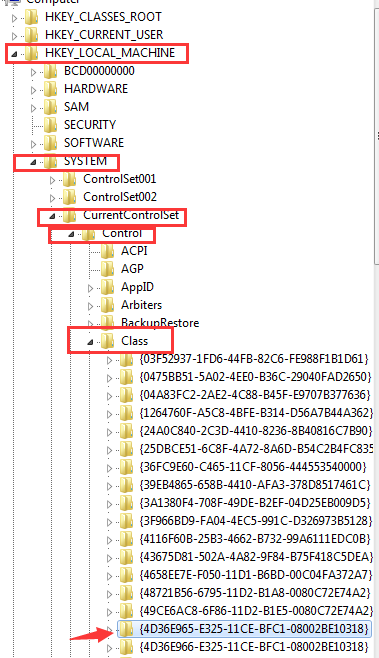 Registry database is very sensitive part of Windows system that can affect entire computer system when gets corrupted. So, it is necessary to maintain this database and protect it from external infection. It can become damaged or broken because of improper removal of programs, computer virus infections, rootkits, Trojans, improper computer shut down and more. Internet browser saves lots of information to provide fast service but sometimes this can affect the performance of the Computer system or laptop. So, it is suggested to remove temporary internet files from the web browser after a fixed time of interval. Through this, you can enhance your PC speed and make PC healthy. Defragmenting hard drive or partition of your PC’ hard drive is really effective and may enhance PC speed. You can do this with the help of a given internal disk fragmenting tool. It is also necessary to verify that your computer’s hard drive is error free or not, if you are admin of your system then it is compulsory to make sure that disk is error-free or not, run chkdsk command to do that. This command is able to scan PC’s or laptop’s disk drive completely. There are lots of unnecessary applications that can affect PC’s performance by consuming CPU memory. So, it is recommended to uninstall or remove unwanted application/tools/software from your computer as soon as possible. When you boot your computer or laptop then some important application gets executed automatically, but it is found that some unnecessary apps also get called when the system booted. So, remove the entire unwanted program from the startup list of your system. Through this, you can also enhance the boot time of your computer. After sometimes lots of unwanted or junk files/folders may affect the PC’s performance, so you should remove all these junk files and folders from your computer/laptop in the manner to enhance speed. A faulty hardware can also affect the system’s performance so make sure that your computer or laptop has the proper hardware to support Windows operating system. Is your system’s desktop is completely packed with files and folders? If your answer is YES then you will notice that system has been running slower and slower. Keep your desktop clean from files and folders in the manner to enhance PC speed. 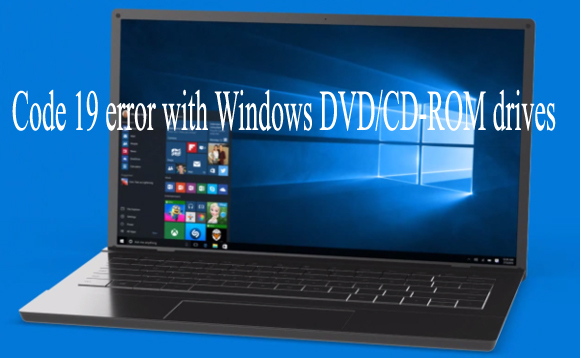 Want to get rid of Windows 10 DVD/CD-ROM Error: Code 19 error when trying to use Windows DVD/CD-ROM drives then follow the given solutions one by one.